Huff Post published a list of recommended Halloween horror movies. John Keel thoroughly enjoyed the film, and was touched to see his name on the screen. He never thought that would happen to him, he told his friends (like me). The writers had fun with the script, and the film is a series of in-jokes. For example, John Alva Keel was born Alva John Kiehle, and the first “John Keel” character in the movie is named “John Klein.” Alan Bates’ character has a similar name game. In the new motion picture, The Mothman Prophecies ( based on the book of the same name by John Keel), chemical plant worker “Gordon Smallwood” (Will Patton), is deeply upset by late-night visits, he thinks, from reporter “John Klein” (Richard Gere). ”Smallwood” also believes that an entity named Indrid Cold is communicating with him, and this is slowly driving him, well, to turn a phrase, batty. ”Gordon Smallwood” is loosely based on contactee Woody Derenberger, who reported encounters with an Indrid Cold in West Virginia during the period of the Mothman sightings there in 1966-1967. This is all rather obvious, and the “Smallwood” and Woody link is not hard to see. No one answered, but many were interested in learning what the in-joke was all about. 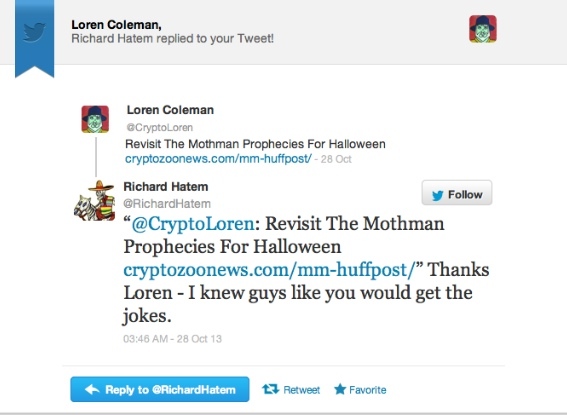 The Mothman Prophecies movie has many layers of meanings and a few inside jokes: from the Fortean number game turning up in the night visits related by “Gordon Smallwood”, the selection of names (e.g. Leek = Keel), and even on-camera appearances. Notice the imposing figure of the bartender at the Marriott who helps the Richard Gere character with the television channels. That’s director Mark Pellington in his Alfred Hitchcock-like cameo. There have also been several strange occurrences associated with the movie’s release. 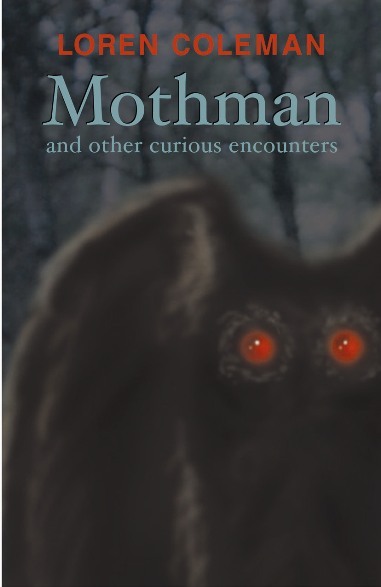 A special screening of The Mothman Prophecies for me and 199 of my guests [my university documentary film course] in Portland, Maine, on January 23rd, did not occur without a visit from the weird. One of the most bizarre experiences of my movie-viewing life happened with about 15 minutes to go in the film. It was the point at which Richard Gere and Laura Linney are arguing about whether her character should go help with the governor’s security at the chemical plant. During that conflict, up on the big screen, the film stuck. It stopped. It slowly started melting. The film was burning right in front of all of our eyes. It moved a little and then burned more. Strange shades of black, orange, and red. Richard Gere’s ear seemed to be the source of ghosty images of melting film footage. We all watched in horror, transfixed. We all were trying to understand if this was part of the film. The movie strip began to burn across the screen and people began to yell, “It’s going to break!” Then a fellow film professor, Dan Porter, jumped up, ran down the aisle, and found someone to deal with the unattended projector. Everyone was more than a little freaked out by this experience happening with *this* film. The theater people turned off the projector, the lights came up, and then we waited. And talked and talked about the eerie melting. In about five minutes, we all were watching it again. Bizarre. The real Point Pleasant, West Virginia, which had a special showing of the movie on Thursday, January 24th (a day before the national release) experienced phone outages and power blackouts all day. By Friday, the hospital’s phones in town could call locally, but not across the Ohio River. After the program was over, 12:23 AM to be exact, (yep, the Fortean number game again), I wanted to look into a mirror to see what toil Mothman had taken on my face. As I began to look into the mirror, an overhead light that had been on all night, blew up. I was in the dark – again. This is just getting a little too strange.